One of the easiest ways to get around New York City is by booking a ride on one of Gray Line's Red Double Decker Buses! Hop on and Hop Off. No need to learn to read a subway map or fumble your way around on city buses. 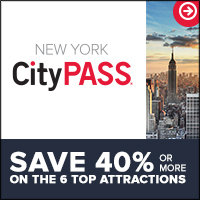 We highly recommend New York Sightseeing for from $48.99 per person. What do you get with bus tour? You get unlimited hop-on, hop-off privileges at over 50 stops, and includes all four tours - the Uptown Loop, Downtown Loop, Brooklyn Loop and fantastic Night Tour! Book online now and save! Read on to find out what you can see and do on the various tours. Downtown Loop - This tours gives you easy access to all of the best sites in Downtown Manhattan. If you stay on the bus for the complete tour, it takes approximately 2 hours (traffic and other factors can effect the time and route). The tour begins at Times Square, and then you'll see the Broadway Theatre District, Macy's and Madison Square Garden, The Empire State Building, The famous Flatiron Building, The Union Square Shopping District, Greenwich Village, Soho, China Town & Little Italy, City Hall & The Brooklyn Bridge, The World Trade Center Site, Whitehall Street (where you get the ferry to the Statue of Liberty), South Street Seaport, The Lower East Side and The East Village, The United Nations, The Waldorf Astoria, Rockefeller Center and Central Park. Uptown Loop - This tour takes you to the heart of Manhattan and beyond. The complete tour takes approximately 2 hours (traffic conditions and other factors will effect time and route). There's no better way to see uptown with little hassle. The Uptown Tour begins at Central Park, Columbus Circle, Lincoln Center, The Dakota Hotel and Strawberry Fields (in Central Park), The American Museum of Natural History, Riverside Church and Grant's Tomb, The Apollo Theatre in Harlem, The Harlem Market, Museum of the City of New York, The Smithsonian Museum of Design, The Jewish Museum, The Guggenheim Museum, The Metropolitan Museum of Art, The Whitney Museum, and the Central Park Zoo. Brooklyn Loop - Do you want to get off of Manhattan Island and see how the rest of us live, then visit Brooklyn. This tour makes seeing the sites in the city's most populated borough quite easy. Pick up the Brooklyn Loop tour at the South Street Seaport and let the fun begin. You'll see the Brooklyn Mariott, Cadman Plaza, The Brooklyn Promenade (a Brooklyn must see), Old Fulton Landing (Grimaldi's Pizza and the Ice Cream Factory), Grand Army Plaza, the Brooklyn Public Library, Juniors Restaurant, the Fulton Street Mall, The Brooklyn Museum and The Botanical Gardens. Schedule - Year round except January 1 and December 25th. There are several places around the city where you can purchase tickets and catch the bus. We recommend that you get your tickets online at a discount at Viator.com, a premium online sightseeing and excursion tour website. Happy Traveling and Enjoy New York City!! We highly recommend New York Sightseeing for hassle free travel around the Apple!